CFD is an abbreviation for Contract For Difference. CFD:s are a very powerful tool that you can use to leverage your investments to make large profits even though you only have a limit amount of money to invest. 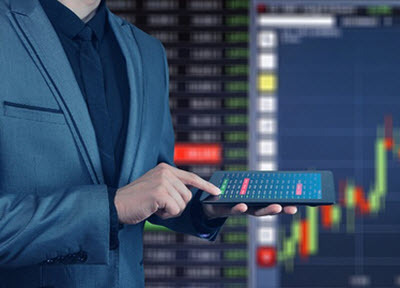 CFD certificates is a perfect tool for day traders with limited resources and for other investors who are willing to assume extra risk to be able to supercharge their returns. A CFD is a way to expose yourself to a large market position without having to commit a lot of money to the trade. Buying a CFD exposes you to the same risk and opportunity as purchasing a lot larger stake in the asset directly. Buying a stock based CFD with leverage 1:30 exposes you to the same position as an 30 times larger investment directly in the stock would. You will earn or lose the same amount of money as you would have if you invested 30 times the money in the stock. You buy 30 shares in stock A. Each share cost USD100. You invest a total of 3000 USD. A little later the stock has increased in value to 105 and you chose to sell. You get 3150 and earn 150 from the trade. A 5% return on your investment. You buy a 1:30 CFD based on stock A. You pay 100 (stock market value) for the CFD. You exposure is the same as if you purchased 30 shares. The stock increase in value to 105 and your close your position. You earn 150 (5*30). A 150% return on investment. The profit remains the same in absolute numbers in both examples but the gain in percentage is a lot higher in the example where you invested in the CFD. If you would have invested the same amount in both cases then you would have earned 4500 from the CFD and 150 from the stock. A huge difference. Before you read any further it is important that you understand that CFD certificates is one of the most high risk financial instruments that you can ever trade. How high risk you assume trading CFDs depends on whether you are trading bear or bull certificates and how high leverage you use. You can lose more money then you invested while trading CFD certificates. You can lose more money then you have deposited in you trading account when trading CFD certificates. You are obligated to settle your debt to the CFD broker if you lose more money then you deposited to your account. Your loses if you are trading with bear cfd certificates are theoretically unlimited. Your loses if you are traded with a bull certificate is limited by the fact that the value if a asset is unable to sink below zero. You loses can still be very substantial. Most CFD brokers make a margin call and close your position if the money in your account are unable to cover further losses. The broker has no obligation to do so. You can never assume that your losses will be limited to the money you have in your account. The broker may chose not close your position or be unable to do so until you suffered big losses due to a rapid fall or increase in the value of the underlying asset. Different brokers offer different leverage on different asset classes. You will usually find the highest leveraged being offer for currency based CFD:s. The leverage offer can be as high as 1:500. Stocks are usually traded with lower leverage. Some brokers offer 1:250 but it is more common that broker offer 1:30 if you want to trade stock backed CFD:s.
May traders prefer to trade with the largest leverage they can find. They do this because this can earn them the most money. It is very important to remember that high leverage can lose you a lot of money as well. The pendulum swings both ways. CFD certificates are designed for short term positions. This makes them ideal for day trading. CFD:s allows you to make large profits while committing a limited amount of money to each trade. It is very important to never leave open CFD positions unattended and you should always use tools that allow you to automatically close your positions if certain criteria are met. This limits your risk. You are allowed to keep CFD positions open as long as you want but if you keep them open more then one day then you will need to pay an overnight fee for every night the position remains open.